Helping children to set their own boundaries and limits is one of the most important things you can do as a parent. Not only are you teaching your children how to think independently, you also teach them how to treat themselves as well others. When I was doing some background for this post, I was surprised at how often articles popped up about setting boundaries with your adult children. A lot. Makes me wonder if those kids weren’t taught how to take other people’s boundaries into account. When children have their own firm boundaries, they are more likely to succeed throughout their lives. If you’ve had difficulty setting these up in your home, take a look at these ten ways parents help children set boundaries and limits. To help children understand, recognize and set boundaries, begin by setting a few basic boundaries that apply to everyone. Core principles are a good place to start. For example, you may want to include boundaries that include safety, respect, responsibility, etc. When children see and respect other people’s boundaries, they are better able to set clear boundaries for themselves. We were just talking this morning about when one sibling asks the other to stop, then we need to respect that request and boundary. These boundaries would probably fall into the “safety” and “respect” categories. When it comes to physical contact and personal space, everyone has their own comfort zone and levels. Regardless of age, everyone has a right to protect his or her body and personal space. For example, if 3-year-old Janie doesn’t want to hug Aunt Martha or anyone else, she has a right to say no and expect the wish to be respected. Coercing or making children dismiss their own feelings can lead to confusion and self-doubt, as well as children devaluing their own needs and feelings later. These boundary lines allow you and your children to separate me from you. They help everyone to accept responsibility for their own actions and feelings. Emotional boundaries also protect you from putting too much importance on feelings and situations that we have no control over. While it’s important to be able to separate yourself from others, it’s also important to be empathetic, caring, thoughtful, considerate and respectful. When someone crosses one of your emotional boundaries, it’s ok to tell them what happened. Make time to have family meetings as well as private conversations with your kids. Give children a chance to express their successes, failures, questions and concerns. Children who feel as if they have a voice and a choice are more likely to follow rules and adhere to boundaries. Show your children that their opinions are important by carefully considering their perspective and explaining why you make your final decisions regarding boundaries. Make sure your children are aware of the consequences that will take place beforehand should they choose not to respect a boundary or limit. When choosing a consequence for a behavior, allow your child to have input. And try to have the consequence be a real-world consequence directly connected to the offense. Also, make sure it is age appropriate and relates closely to the offense. This teaches your children how to set their own limits as well as predict possible outcomes and consequences in later life. Follow through with your expectations and consequences. If you decide a rule stands, it stands. You must mean what you say and say what you mean. Otherwise, children will constantly push the boundaries to manipulate you. Boundaries are dynamic. As your child’s understanding, maturity level and needs grow, boundaries should be adjusted. Being consistent teaches children to stand firm in their beliefs and what they feel is acceptable. Consistency gives children the courage to stand up for themselves and to set healthy boundaries. Talk to your children about what it means to be a good friend. Let them decide what their boundaries are. Help your kids recognize actions of a good, healthy friendship and those of an unhealthy, destructive friendship. People who reject, bully, tease or disrespect your child are not good friends. Those who accept your children for who they are, treat them with respect and truly care are good friends. When your children are older, this will also be important as they choose a boyfriend or girlfriend so it’s a good idea to begin putting these boundaries in place at a young age. Teach children that everyone has different likes and dislikes, as well as comfort levels. If a sibling or friend wants to play football, it doesn’t mean that he/she has to play. Help each of your children figure out what works best for them and what doesn’t work at all. Talk with your children about how to verbalize what they’re thinking or feeling. Give them key phrases that they can use to in certain situations. Use “what if…” scenarios and ask the children to explain what they would say and do in certain situations. Don’t take sides in sibling squabbles. (I know that can be tough!) Teach them how to solve problems on their own. 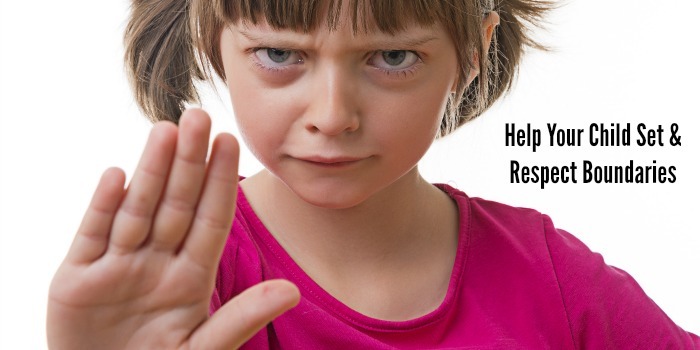 Rescuing your children each time there is an issue keeps them from taking personal responsibility and their social skills may suffer if they don’t get to practice making compromises and working out solutions without a mediator. Get more parenting insights on The Jenny Evolution!